When compared to his counterparts, 2008 WSOP final-table participant Craig Marquis has somewhat limited experience in live tournament play. Marquis, however, has plenty of online knowledge instead, primarily at Full Tilt, where he goes by the name "CraigMarq." Like most his age – at 23 he's the second youngest player at the final table – he prefers to play poker on his computer, juggling eight or more tables at a time. Marquis has said that he likes the faster pace of multi-tabling over the slower pace of live poker, where he is more apt to get distracted and lose focus. But Marquis managed to stay focused for seven long days, outlasting over 6,800 other players, to make the biggest final table of his life. All that after just a year and a half of poker experience. Marquis, a student at the University of Texas, Arlington, where he studies finance, started playing online at the $2/$4 levels and quickly progressed to the $200/$400 cash games and higher. His live tournament experience is almost exclusively limited to the World Series of Poker. He played in the 2007 WSOP, cashing in the $5,000 PLHE where he finished 34th for $14,030, and in the $1,000 NLHE where he came in 30th for $16,133. During this year's series, he played in 17 different events, but had only one cash, for a $5,596 payday in the $1,500 NLHE Shootout, prior to the Main Event. His roommates in Las Vegas, online pros David "raptor" Benefield and Joe Commisso, had a much better run than Marquis going into the Main Event, more cashes and, for Commisso, a bracelet in the NLHE 6-max tourney. But Marquis was apparently saving himself for the big show. One would have thought this online player would have won his way to the Main Event through an online satellite, but instead he bought directly into the $10,000 NLHE event. 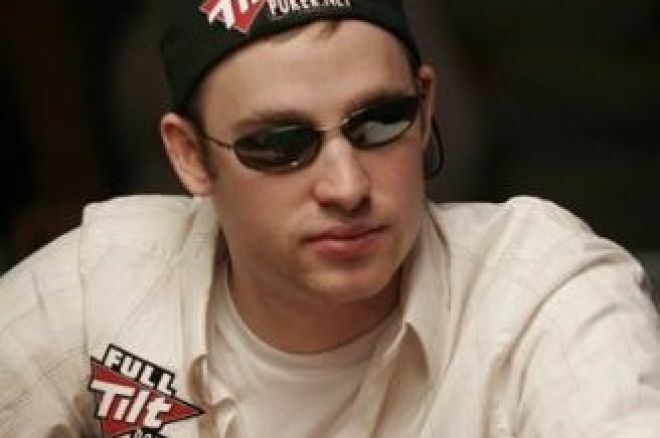 According to Benefield's poker blog, he has a portion of Marquis's Main Event action. Both he and another friend, Internet legend Tom "durrrr" Dwan, were on the rail watching as Marquis eliminated the tenth-place finisher, Dean Hamrick, and guaranteed himself a minimum $900,670 payday and a return ticket to the Main Event final table. It was Benefield, a fellow Texas college student, who inspired Marquis to take up poker. Marquis had been making a living selling cell phones, but quit after learning how to play poker, determined to go professional like his friend. And soon enough, he was able to support himself playing mid- to high-level online cash games. During his Main Event run, Marquis could be seen wearing dark Oakley sunglasses and sipping endless cups of coffee. Marquis' style of play is very focused and deliberate, taking an analytical approach to the decisions he has to make. Marquis finished Day 1a with 71,050, but failed to improve the next day, ending Day 2a at just 71,000. He managed a double-up on Day 3, finishing at 147,000, but was still near the bottom of the remaining 474 players. Then his tale changed; Marquis may have began Day 4 near the bottom in chips, but by the end of the day he was right back in the hunt for the bracelet. In the last hand on Day 4, with the board reading 5-6-7-5-6, Marquis faced a decision for his tournament life. According to the bloggers covering the hand, Marquis tanked for several minutes. "I don't know what to do," he said. "I'm never good here." More time passed. "I have 14 big blinds, that's not terrible," he said, indicating where he'd be if he folded. Finally he called. "I have jacks, you win," he said, turning over his . Much to Marquis' surprise, his opponent mucked. He finished Day 5 with 1,748,000 in chips, then stormed through the field on Day 6, finishing the day second in chips with a whopping 11,460,000. But Day 7 was a series of ups and downs – mostly downs – on his way to the final table. After scooping the first pot of the day, taking over a million chips off of Tiffany Michelle, there was a long spell where Marquis was chased off hands, slowly but surely seeing his monster stack chipped away. In one hand, after his own reraise to 4.5 million was re-reraised to 16 million by Ylon Schwartz, Marquis again mucked, and fell to 7.5 million. More losses brought his stack to the five-million-plus range. Then Marquis hit a hand at just the right time. All in against Dean Hamrick, Marquis was behind to Hamrick's . The flop was and Marquis needed an ace or running straight or flush cards to win. And that's exactly what happened when the board ran out and to give Marquis his flush and more than double him up, to about 11.2 million. Marquis proved to be poison to Hamrick. On the last hand of Day 7, Hamrick moved all in for 3,420,000, Marquis moved in over the top and isolated his man. The cards were turned up, for Hamrick, for Marquis. The flop was and no help showed for Hamrick on the turn or river, meaning the final table was set. When he returns in November, Marquis will try to beat Hellmuth's record as the youngest WSOP Main Event winner, even though, with the second smallest chip stack, he has a long way to go to reach that goal. But he realizes he's already accomplished quite a bit, as he told a PokerNews reporter when it was down to eleven players. "Getting this far in the main event is like winning the lottery." That may be true, but going all the way would be even better. PokerNews: Craig, as someone who may be more in tune with online play than any other member of this year's final, what do you think the online game has taught you that you can bring to the final? Craig Marquis: I think the sheer volume of hands I've played definitely helps my game a lot. Playing multiple tables online just puts you in so many situations over and over again. I'm also fortunate enough to have friends who are among the top players online, so I'm not lacking in the advice department. I also feel that playing a lot online makes you pick up a bit better on patterns and frequencies. PN: During the Main Event, you spent the first three days mired in the pack before a Day 4 surge brought you into contention. Was there a hand that you look back on as being key to your success? Marquis: I ran really well on Day 4, I managed to win all of my flips, and also cooler someone. The most important hand that I played during the entire tournament was definitely the one versus Brandon Cantu, where I managed to pick off a bluff of his and double up into the chip lead on Day 6. Also clearly the huge suckout versus Dean Hamrick was great as well. PN: The topic of coaching has been a focus of discussion during the run-up to the November finale, and you're already close friends with several players who would be considered solid online coaches, such as David Benefield and Joe Commisso. Can you talk about your thoughts on the topic, and what your own plans have been over the past three months? Marquis: Well, I do have the good fortune to be friends with a bunch of amazing players, but I feel like there isn't a whole ton that one can do to improve their game by emulating someone else. I think a lot more problems can be created than solved by trying to emulate someone else's style. That being said, I'll definitely be talking SOME strategy with them, but I haven't been doing any intensive coaching or anything. I have my own style of playing that I feel works well for me, and so I plan on just sticking to that. PN: You were involved in the hand that decided the final-table lineup, eliminating Dean Hamrick, this after catching your own good fortune in an earlier hand against Hamrick yourself to stave off elimination. What ran through your mind as that final hand unfolded? Marquis: Really, I was just hoping that an ace didn't peel off. I also thought it was ironic that we got it in with pretty much the same hands against each other before and I ended up winning both. PN: What are your thoughts on your final-table opponents? Who impressed you on the way to the final? Marquis: Unfortunately, everyone at the final table is better than I would've hoped. The players that I would least want to play heads-up would be Ivan (Demidov) or Peter (Eastgate), but everyone is pretty solid. PN: And the big "What if?" If you win, you'll supplant Phil Hellmuth as the youngest Las Vegas WSOP Main Event winner ever. What do you see the future holding for you in the event you take it all down? Marquis: Its hard to say, but I would definitely do my best to promote online poker in whatever way I could. I feel like the past few years, the winners haven't done very much to do that, and since that's where most my career has been played, I'd want to give something back. Also it would obviously be amazing to take away one of Phil's accolades as I've played with him many times and he tends to talk a lot of trash.